Jos olet tulossa Pensacola Beach, tulevat PENSACOLA BEACH. Ei ole yksikkö, joka istuu lähempänä vettä. Älä tänne asti on "Peek-a-boo" näkymä rannalle, nauttia 180 asteen näköala vettä niin pitkälle kuin näette. Katso delfiinejä Splash ja pelata rentoutumista teidän parvekkeella. Onko lasi viiniä samalla kun lapset leikkivät hiekka, aina näkyvissä. Ehkä kävellä aamulla ystävällinen peloton nosturi, joka usein tulee vuoteen. Tämä on tyyppi paikka, jossa muistot tehdään. Mitä itse laite, nauttia rauhallisesta yöunet tyynyn päälle king size patja kuunnellen valtameren aallot läpi rannan tuulilasin tai rentoutua toisessa makuuhuoneessa on muhkea parivuoteella. Kaikissa huoneissa on televisio. Jos sinun on yhdistyä reaalimaailman vain hieman, turvallinen WIFI on mukana. Rakennus uudistettiin vuonna 2007 ja se on juuri päivitetty ja maalattu vuonna 2016. Kaikki tarvittavat keittiövälineet, lasit ja flatware tarjotaan, kuten kaikki vuodevaatteet ja pyyhkeet. Ota lyhyt kohteliaisuus vaunun kyydissä kesällä alas Boardwalk ruokaa, juomaa, vettä toimintaa, minigolf, mikroautot ja enemmän. Had an excellent week on beautiful Pensacola Beach. The accommodations were better than described. Greg was great to work with and was extremely helpful. Would highly recommend to anyone wanting to stay right on gulf. We really needed a true vacation not like the typical hustle and bussle trips we usually take. Gregs place is the perfect place to relax and unwind. 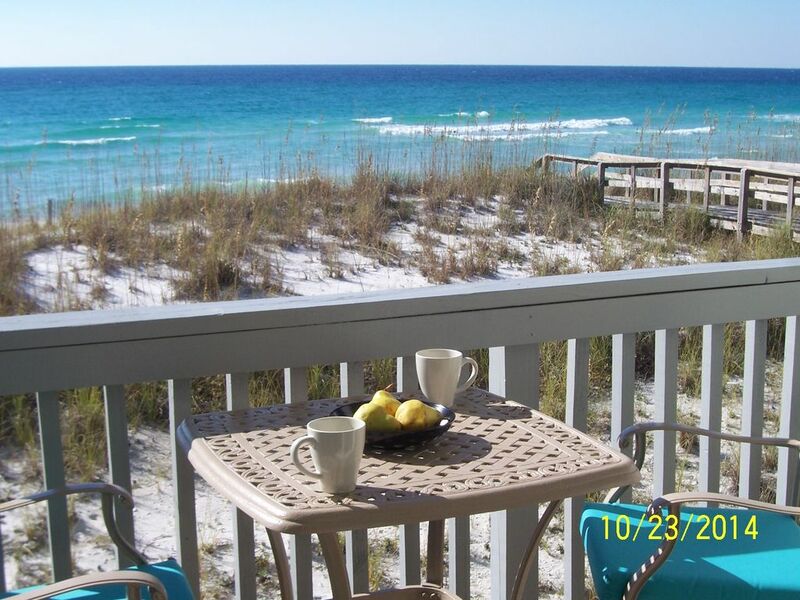 We loved having our morning coffee on our private balcony while watching the Dolphins. Wonderful condo and wonderful hosts! This condo is perfect! The location is right on the beach. We could not have asked for a better place to spend spring break. Greg was very kind, he met us at the condo to welcome us. The condo was clean and had every amenity. We woke up to the sound of waves, drank coffee on the porch and watched dolphins every morning. The local restaurants were delicious and just a few miles from the condo. I highly recommend staying here. We will definitely be going back! Everything was just like the pictures. Great place, my family & I really enjoyed this place. Very laidback, great seafood & friendly people. Looking forward to going back next year. This perfect little condo was just what we wanted as we didn't want a huge high rise where we had to wait for an elevator all the time, not to mention the beaches outside weren't crowded like at high rise places. We were steps to the beach and it had everything we needed! The beds were very comfy as was the living room. The tvs in every room were great especially when traveling with a little one that needs to have Disney junior when winding down. Will definitely be back to visit! Thanks Greg! Side note: Greg was also amazing to work with and super responsive. Rentals are from Saturday to Saturday or between Saturdays. All reservations must be confirmed by phone. The party responsible for the charges and billing must be one of the guests staying on property. To rent this condo you must be 25 years old.